Recently, we held our first yard sale to raise funds for a cure for GM1 Gangliosidosis. GM1 is a rare fatal neurological disease. Tragically, my daughter was diagnosed with it over 2 and half years ago. Every contribution helps and it’s important to get the word out. We continue to encourage others to join the fight to save our daughter’s life and to save the lives of all those affected by this condition. At the yard sale, I was struck by two experiences in particular. In the first case, I was selling a guitar. I was thinking out loud when a woman asked for the price. I said, “Well, it was originally $100. It does have a broken string, but it is also for charity.” In the back of my mind, I had not settled on a price, but I definitely did not expect $100. I wanted to ask more about her children, but I also did not want to ask too many questions having only just met her. I am very grateful for her generosity. I thought about how death is a part of life. So many of us have been affected by extremely painful experiences, yet these experiences are often kept private. Those experiences do not always rise to the surface in our more mundane interactions. “You probably know what we are going through then,” I replied. She nodded silently. It was a fleeting moment of mutual understanding. The second experience took me by surprise in a different way. I like to believe I’m a minimalist, but over time, we have accumulated stuff as many people do. I realized I felt uncharacteristically attached to some of the items we put out for sale. The time we prepared for the sale was a bit frenzied. We gathered items as quickly as possible. I realized that one of my grandmother’s books was in the sale. It was a beautiful old book that she liked very much. I put it into the sale because we have not read it. It’s been a year since my grandmother’s death, a year since we were given some of her belongings. The woman turned to me and said “Wow! Anything for a buck, huh?” I explained that this is for a nonprofit for my daughter and for children who are dying. I handed her the brochure and she left without the book. In one case, I feel someone was very generous by paying the full price for the guitar. In the second case, I was taken aback by the “Anything for a buck” comment given the nonprofit sign on the table. All the funds are donated to medical research. Perhaps this woman was just annoyed because she wanted the book. I can understand that she might also have been peeved because I said “$1 or $2.” It was really $2 that I offered while haggling. In truth, I realized I did not want to sell the book at all due to its sentimental value. As I stood at the yard sale, we sold odds and ends. I thought about how much all these material items truly mean. I thought about how much the difference between $0, $1 or $2 is in the context of raising funds for medical research. I am glad that I managed to give this particular woman an informational brochure despite her annoyance. I believe 100% that children with GM1 Gangliosidosis deserve a chance at LIVING. I try my best to live each day with as much hope as possible. The reality is that the deck is not stacked in our favor. This is rare degenerative disease. As time passes, regressions advance. Some of the changes and experiences are very hard to accept. Generations of children have been suffering from this disease for over 130 years which is far, far too long. Someday, I may be the woman who says I have lost a child. We do not ask for pity . We do not ask for $1 or even $.01 of people’s hard earned funds lightly. In reply to that blunt comment over $2 versus $1 for a book, “YES, anything for these children.” Anything for them. We will continue to fight for a cure and to fight for awareness. These children are truly deserving of “a buck” or two and so, so much MORE. They deserve hope and treatment as opposed to a descent into a vegetative state riddled by seizures until death. Thank you to the sweet woman who bought the guitar and for that very vulnerable admission at a yard sale. Thank you to all our friends and supporters who have been so very generous. I’m truly grateful. My sweet daughter is so very fortunate to celebrate her 8th birthday. Two and a half years ago, we were faced with her diagnosis of GM-1 Gangliosidosis, a rare degenerative neurological disease. There is no treatment or cure. Her life will be cut short without incredible medical advances. Yet, here we are. Another birthday. Another entire year. We are so very grateful for every moment. We adore her smile, her hugs, and her love. Not a single doctor can tell us with any confidence how many birthdays she will celebrate. One specialist guessed a life expectancy into her teens or perhaps even into her twenties. We can only hope that is the case, but is it quality or quantity that matters most? We are living in the face of a chronic and life-limiting condition without a proven treatment and without answers. Ironically, even those who do not face such a devastating diagnosis, do not truly know their own futures. It’s simply much, much more likely that our daughter’s life will be cut short by decades more than the average lifespan. It’s also very likely that her life will involve challenges that the majority of the population typically do not face. Still, we are hopeful. We have been told that a clinical trial may arrive as early as next year. We fought tooth and nail to obtain the only medication which is thought to be possibly beneficial. Through a study, we embarked on the Modified Atkins diet in an effort to possibly enhance the efficacy of this particular medication. This special diet deprives our daughter of nearly all sugar. On her birthday, there will be no cupcakes, frosting, or sweets. If we do make a “cake,” it will be prepared without the normal ingredients: flour and sugar. And miraculously, despite the nightmarish diagnosis, she’s eight. She’s living life. There are many nagging questions. Is the medication working? Will our insurance approve the unreasonably expensive medication again? Is the diet helping? Will the clinical trial happen on time? Will she be in the clinical trial? Do we actually want to be in the first clinical trial? When will she stop walking? When will she stop speaking? How many birthdays will she have? We do know that many children with this condition have a much more severe form of the disease. These children’s lives are measured in months and days, rather than years. Tragically, several children who were diagnosed around the same time as our daughter are no longer with us on this earth. Given the situation, what does one do? How do we celebrate given that this is a degenerative condition and the clock is always ticking? We celebrate fiercely because this diagnosis has taught us so much. Birthdays are truly an event to celebrate, despite time also being our enemy. Today, in honor of our sweet girl and all the children who suffer from this horrible condition, find something to celebrate. It may be something small. Savor the first, middle, and last sip of your morning coffee. Take a deep breath of fresh air as you open your door. Commit an act of kindness. Live and love fiercely, because one never knows how many birthdays remain. To follow Iris’ story on Facebook, click here. Just recently, when I was speaking to a friend, I explained a new development in the progression of my 7-year-old daughter’s condition. This particular disclosure was about something no one would ever want to know is happening to a loved one. It was a detail I tried to avoid learning, but I felt obligated to read the medical records when they arrived in the mail. I know that I should expect GM1 Gangliosidosis to get worse. It’s a progressive neurological disease. I know the prognosis and it’s definitely not good. I’ve spoken to enough doctors to know that no one wants to give me a false sense of hope. I’ve read more about GM1 than I care to remember. But knowing the disease characteristics is not the same as accepting the disease as it plays out in our lives. I stared at the medical records glumly. There it was in black and white…yet another confirmation that this is a “big time” disease. GM1 Gangliosidosis is a rare disease and it is degenerative and fatal. There’s no treatment or cure. The textbook progression is marked by the worst kind of milestones: feeding tubes, pneumonias, loss of speech, loss of the ability to swallow and the list goes on. Try as I may, at times, it’s impossible to ignore the gravity of the situation. We hope for plateaus. We live one day at a time. As unrealistic as it may be, we still hope a cure might arrive in time. When I confided in my friend, “So what,” he replied to me. At first, I was incensed. “So what? !” I just shared an intimate detail that I could barely internalize. I ran the conversation by my husband. His reply: “It’s not the most sensitive thing to say, but in a way, he’s right.” I’ve been told repeatedly what will happen, so why should the test results have been a surprise? I’m human. It was difficult to accept the new information and the blunt response. In truth, the words on the page of the medical record changed nothing. This single test result, while very disappointing was just a factoid. It has since faded to the recesses of my mind. The comment “So what” jostled me from my funk and forced me think about the intended meaning of the comment. 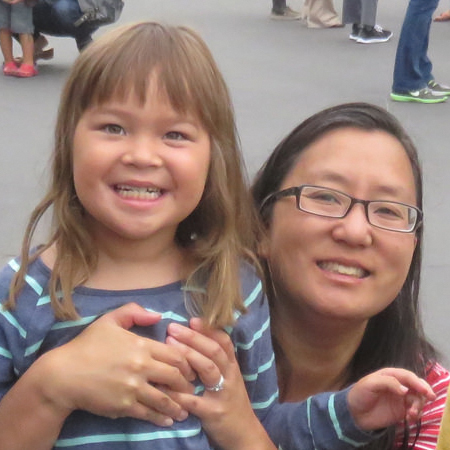 A medical test result does not change my love for my daughter. This particular factoid does not truly impact our day to day lives. The time I have with my daughter is too valuable to let myself be consumed by this disease. I try in earnest to not to dwell on what was or what will be. Sad news is startling and the ongoing impact of this condition is undeniable. The entire experience of living with a disease like GM1 is not pleasant in any way, shape, or form. Still, the situation is what it is. We’re fighting this daily. We get knocked down. We pick ourselves back up. A doctor once tried to convince me that this disease is not so hard on the children, but is much harder on the parents. While I agree that it can be very hard on the parents, I believe it’s much harder on the actual affected person. It is my sweet courageous daughter who lives each day as her own body fails her and destroys her central nervous system. It is she who must experience the full brunt of every symptom, blood draw ,and medical procedure. Even before diagnosis, at a very tender age, it is she who understood she would never keep up with other kids on the playground. It is she who fights against all odds for every footstep and for each syllable on her tongue. She is my teacher. She is my hero. So, that’s what. Frozen was released in November 2013, almost 2 years ago. It was a massive global success Children throughout the world sang “Let It Go” everywhere from their bedrooms to the streets.The box office receipts clearly indicate that there were repeat viewings while the movie was in theaters. Once the DVDs were released, parents endured countless repeat viewings. Parents and children alike learned the lyrics to all the songs. Some parents learned the lyrics reluctantly so. My daughter Iris was 5 when Frozen was released. She liked it just as much as any other little girl. OK, she liked it perhaps a bit more than average. I for one would love to hear my daughter sing the lyrics of “Let It Go” once more. I will always remember Frozen fondly even though it is now fading from people’s minds. I’m not a Frozen fanatic, but I have a very good reason for liking the film. Two years ago, my daughter could still sing the lyrics to “Let It Go.” Today, I have to coach her through uttering just the three words in the title of the song. The reason she can no longer sing the words is because she has a very rare disease called GM1 Gangliosidosis. This disease is a degenerative neurological condition that will ultimately take her speech and voice. This condition will also end her life if medical research does not advance in time to save her. Frozen was released just 3 months following Iris’ diagnosis of GM1 Gangliosidosis. We had a truly wonderful Christmas that I will cherish always. It was a very Frozen Christmas. Iris received Elsa’s dress, an Elsa doll, the soundtrack, and Elsa’s wig. We danced and sang together. This was the brief period following her diagnosis when we had not initiated the ketogenic diet, a diet which is devoid of nearly all sugars and carbohydrates. Christmas of 2013 was the last time Iris ate any substantial amount of sugar or sweets. She ate her last gingerbread man for the foreseeable future. The simple things such as listening to your child sing should be truly enjoyed. Time passes all too quickly. I can tell you now that the progression of this condition is real. I would give anything to hear my daughter sing again, even if she were to sing the lyrics to “Let It Go” daily a hundred times over. My daughter will likely enjoy Frozen long after other children will have forgotten and outgrown the film. This disease will essentially keep my daughter a child even as she ages. We will cherish her smile and everything about her for however long she exists on this Earth. Despite everything, I hope I will watch Frozen over and over for many more years. To do so would mean that my daughter is still living. Hopefully, she will not be suffering or in pain. As we face this progressive degenerative disease, I truly wish I could summon Elsa to freeze time. In my Frozen fantasy, Elsa could halt the progression of this wretched condition. Everyday, my focus is on enjoying the here and now because today is all we truly have. 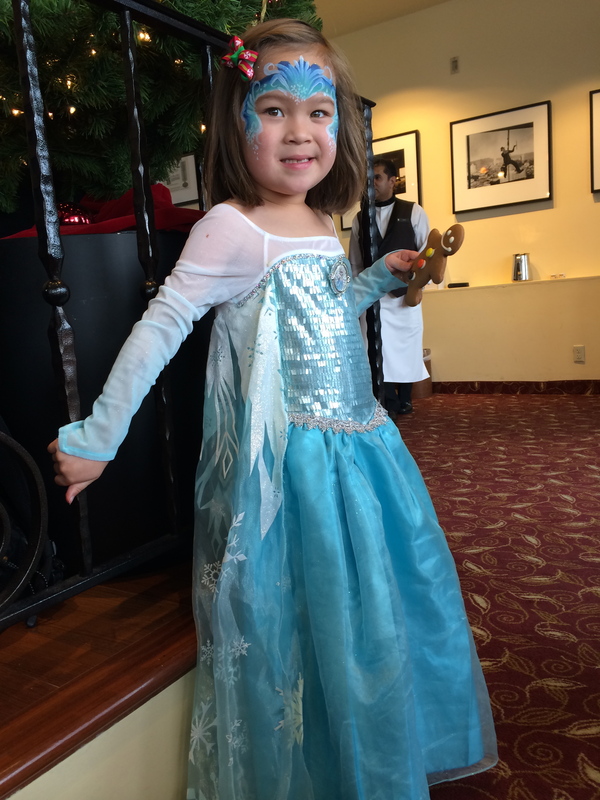 Nonetheless, I will never forget my daughter’s sweet singing and our very Frozen Christmas. I will also always cherish when friends came to serenade my sweet girl with a truly touching Frozen medley. Iris’ sheer joy on this day was a true gift. The value of that pure joy is immeasurable. I will never let these memories go.